John W. Hinckley Jr., who was committed to a mental hospital after trying to assassinate President Reagan 25 years ago, is asking a federal judge to let him spend more time with his family. Prosecutors oppose the request, saying they need to review Hinckley's medical records. 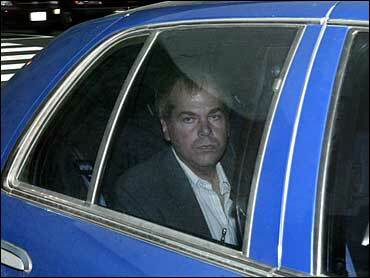 Hinckley, who said he shot Reagan to impress actress Jodie Foster, was found not guilty by reason of insanity in 1982. He suffered from depression and a psychotic disorder that led to an obsession with Foster. Last year, a federal judge approved Hinckley's request to leave St. Elizabeth's Hospital in Washington for seven extended visits with his parents in Virginia. Hinckley is down to his last visit. On Aug. 1 he asked a federal judge to extend that order. "On each of these trips, Mr. Hinckley has complied fully with all of the conditions of release, and not a single negative occurrence has been reported," defense attorney Barry Levine wrote in a court memo. U.S. District Judge Paul L. Friedman has not ruled on the request. He scheduled a Nov. 6 hearing. Last year, Friedman ordered hospital observers to assess the success of each visit to Hinckley's parents. Prosecutors said they have not seen these reports. Hinckley shot Reagan, press secretary James Brady, a Secret Service agent and a Washington policeman in March 1981 as the president emerged from a downtown hotel.